Serviced offices are seeing a huge surge in popularity among small businesses, entrepreneurs, project-based teams, and multinational corporations—and for good reason. They’re affordable, convenient, spacious, and extremely versatile based on the specific needs of your business. Companies of all sizes and statures can stand to benefit from renting serviced office spaces for a number of reasons including increasing their bottom line, upsizing, downsizing, testing out untapped markets, and expanding their operations. Serviced offices for rent are popping up all over major cities as well as their surrounding areas because they offer tremendous flexibility and comprehensive rental packages that only give you what you need and want without any frills. Keep reading to learn more. By definition, a serviced office is a professional working environment that caters specifically to the needs of your business and provides services that work precisely for you. 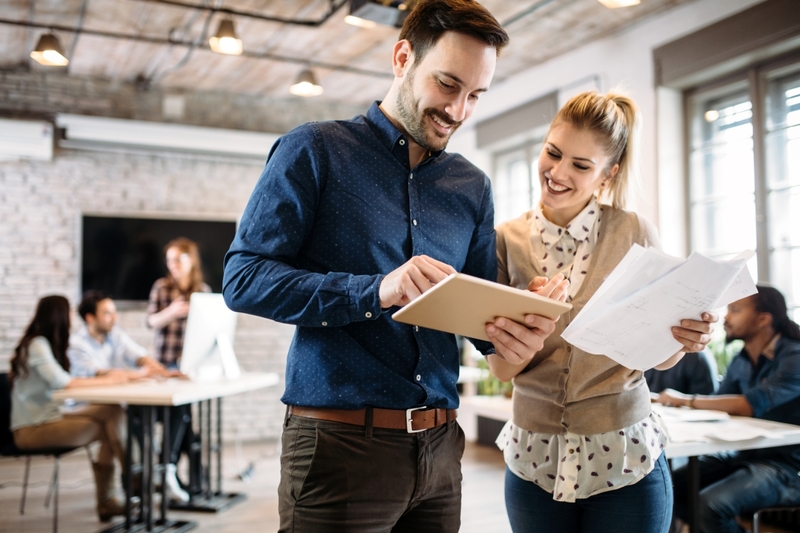 From professional administrative services to IT support, office equipment, and high-speed Wi-Fi connections, serviced offices give you all of the essential tools you need to make your business a success. Regardless of the industry you work in, the type of business model you have, or the goals you have for your company, a serviced office is designed to help you achieve all of these objectives and even exceed them. There are a number of advantages that come with renting a serviced office space for your small business. The key is to have a set business model and attainable goals in mind. And the great thing is that regardless of where you are in your professional journey, serviced offices are available to offer support and help you along the way. Renting a serviced office space can significantly reduce the cost of operating your business and save you a great deal of time in the long run. As the saying goes, “in business, time is money”. Since office supplies, equipment, and furnishings are already provided by serviced offices, you won’t have to worry about purchasing these items, having them delivered, and then hiring someone to set them up for you. If there’s an additional piece of equipment you need that’s not automatically provided by the serviced office rental company, then you can arrange to have it delivered and set up by the IT department. This also affords you the time and ability to focus on other more important aspects of running your business such as managing your employees. Renting a serviced office also means that you’re not obligated to enter into a legally binding and restrictive lease for a set period of time unless you agree to do so. You can have unlimited access to all of the features offered by the serviced office company whenever it suits you. With the option of renting by the hour, day, week, month, or year and receive the support you need; the possibilities to grow your business on your terms are endless. On that same note, renting a serviced office space also reduces the amount of financial risk and liability incurred by your business. You only have to pay for whatever you use and for the amount of time you use it. If you only need to rent a conference or meeting room for an hour, that’s literally all you have to pay for. There are no additional fees and office equipment is typically included in the cost of the hourly rental. Leased office spaces typically mean you’re legally bound to use that space for a minimum of three to five years and sometimes that’s a lot more than what you actually need. Not only is that a huge waste of money and resources for your business, it’s not always feasible for small businesses and start-ups since there’s a lot of uncertainty involved. As mentioned, serviced office rentals offer a wide range of services and support that are designed to contribute to the overall success and growth of your business. With an administrative and receptionist staff, IT support whenever you need it, access to private meeting rooms, the latest office technology, and amenities such as state-of-the-art kitchenettes and breakrooms, renting an office space is the gift that just keeps on giving. A lot of small businesses and start-ups nowadays offer their employees the opportunity to work from remote locations, whether it’s different cities or even countries. That means, sometimes you have to accommodate your employees who work in different time zones by holding meetings at unusual hours and video conferencing them in. That’s why a lot of serviced office spaces offer flexible hours of operation based on when you need to use them. All you have to do is book the meeting rooms in advance and let the building managers know exactly when you need to rent out the space and approximately how long the meeting will take. The cost of relocating your business can be astronomical, especially if you’re moving to a prime location in the city. When you rent a serviced office space, you can easily cut down a lot of those transitional fees because everything is already set up for you and ready to use. In fact, you might even be able to make a little bit of money by selling your existing office equipment that you no longer need. What Types of Businesses Can Use Serviced Office Spaces? Innovative Professional Offices is one of Mississauga’s leading serviced office space rental companies. Located in the heart of Mississauga, our fully furnished, high-end suites come fully equipped with state-of-the-art office equipment, spacious meeting rooms, and open concept office spaces to suit the needs of your business. Book a tour of our office suites today to see for yourself why you should rent an office space from us.